Rinse the quinoa thoroughly in a fine strainer before cooking. 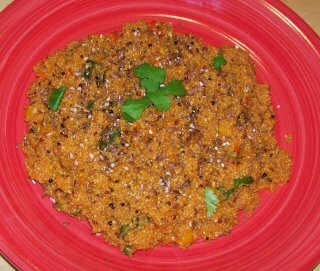 Cook one cup of quinoa into two cups of organic carrot juice, simmer until carrot juice is all soaked in. Add some toppings like sweet peppers, fresh cilantro, sesame, chia and flax seed.